She sits all alone, but can be seen by thousands of motorists every day. She is Nancy Nguyen, a case manager at the San Diego County Psychiatric Hospital, and the face of a campaign promoting the Master of Social Work at Cal State University San Marcos. She appears on a billboard along Highway 78 West at the intersection of El Camino Real. It will be up for one more week. 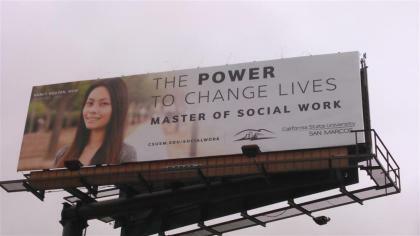 The university asked Nguyen if they could use her image to promote a successful graduate from the program after she first appeared in an internal campaign promoting CSUSM’s Department of Social Work. Nguyen completed her master’s degree in May of 2015 and started working the Psychiatric Hospital three months later.